GALION — A street paving project, which will concentrate on the north side of the city, will begin within a few weeks and hopefully will be completed before leaves start to fall off area trees when the weather turns. At Tuesday’s regular city council meeting, a plan to spend about $270,000 on paving was approved. Bids specifications were to be sent out ASAP to allowed the project to start within a couple of weeks. Last year’s paving project focused on the south side of the city. This year’s paving includes Southern Avenue; Fairview Avenue, from Hetrick Drive north to city limits; Switzer Drive; Riblet Street, from Harding Way East to Church Street and from Church Street to Primrose Street; North Washington Street, from Church Street to Payne Avenue; Summit Street, from North Union Street to Park Avenue; and Liberty Street, from Harding Way East to Payne Avenue. Also included is a stretch of West Parson Street between South Market and South Boston streets. Additionally, some patching work is expected to be completed on North Market Street, between the square and Church Street; and on North Union Street, between Harding Way East and Erie Street. Part of the funding for the paving and patching projects comes from the license plate tax paid by drivers who live in Galion. The goal is to have paving completed by late September. Mayor Tom O’Leary added that Timberlane Drive will receive a little bit of work, too. Some crack-sealing is planned. As far as the Ohio 598 North sewer line project, O’Leary said that barring a lot of bad weather, the project should be completed before school starts. The first day for Galion students is Aug. 21. Russ Kent | Galion Inquirer A worker spent early Friday morning sawing expansion cracks into concrete poured this week on the Ohio 598 construction project between Heise Park Lane and Carter Drive. 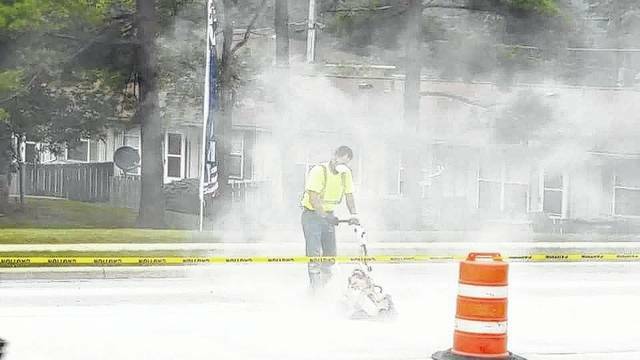 https://www.galioninquirer.com/wp-content/uploads/sites/38/2017/07/web1_worker-in-the-mist.jpgRuss Kent | Galion Inquirer A worker spent early Friday morning sawing expansion cracks into concrete poured this week on the Ohio 598 construction project between Heise Park Lane and Carter Drive.